So you have an idea of the perfect life, but it seems difficult to obtain, right? Well, it is difficult, but it is not impossible. For the longest time people would laugh at me whenever I expressed my goals. They all said, in the most sarcastic tone possible, “yeah, good luck with that”. To most, capturing the future that you have created in your mind is not as impossible as others make it seem. In fact, it is quite possible. Everybody has a different idea of the perfect life, and that is just fine. However, the main goal is the same for each person, and that is trying to find what would make you the most happy, and taking the steps to ensure that you can reach your mountain top. With that said, I welcome you to my first post of three. As the title states, this post is all about establishing the right mindset and creating definitive goals. After all, you cannot move ahead when the destination is unclear. You cannot even begin to plan if you do not believe in yourself. Your goals will be unattainable if you strongly feel that they are too outlandish to accomplish. But it is not enough to simply believe that you can do it, it is more important to know that you can do it. The only boundary holding you back is yourself. Understand that anything is possible, and know that you can achieve any goal that you set your mind to. After you have fully established the powerful mindset, you will be ready to pave a pathway. Paving the path is the most difficult part, but it is much easier when you have a set idea of what you want. It is like the movie The Secret, and if you have not seen it, I highly recommend you watch it. But I digress. In short, you need to define a specific goal before you can take action. Your life is not created by outside factors. You create your own destiny. However, you cannot adventure down the path to your plateau if you do not have a specific goal. It is essential to have a definitive goal so you know exactly what you are aiming at. So, let’s get started on finding the target. You will need a pen, notepad, and silence for this exercise. The first step is to relax in an area where you feel most comfortable. Pick up the pen, look at the piece of paper, and start writing all of the things that you would like to accomplish in your lifetime. After you feel like you have exhausted your ideas, carefully understand why each individual goal is on your list. After a thorough analysis, pick the top five things that you want to accomplish in that list. You should choose those that you can see as a part of a stable life, such as career, desired income, living situation, and health. I say this because all other things, such as a visit to Greece, or a trip to Las Vegas are life experiences that happen while you are strolling down your path to happiness. They are the added bonuses that come along with the adventure of achieving your goal and living your life. Next, you will want to create an estimated timeline. 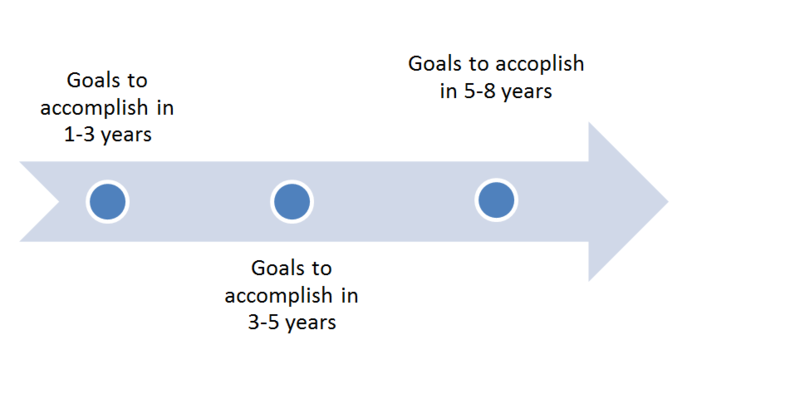 Now, it is important to remember that even though you may set a goal for three to five years from now, it is highly possible that those goals will be accomplished within one to two years. Nevertheless, the timeline is essential because it helps you keep your eye on the prize. Create three time periods with a list of goals that you would like to accomplish in each time frame. Once you have defined your goals and created a timeline, you are ready to start planning the path to your future of happiness. My next post will discuss how to use this timeline to start planning your route to success. Remember, you cannot start planning your path until you know where you want it to lead. With that being said, take some time to thoroughly review your goals and understand why you want to accomplish them. Once you have decided that these are the objectives that you must accomplish in your lifetime, you will be ready to start your journey. I strongly encourage everyone to take hold of their lives and to embrace the fact that they can create their own destinies. If you feel like you are ready for the challenge, and ready for a change, then be sure to come back on Thursday to create a plan of action.